When it comes to being on point, in every category, the NIKON PROSTAFF 5 3.5 – 14×50 Riflescope is a cut above it’s much pricier competition. This is a highly important distinction because you get the quality and performance of the most elite name brands, without forking over the name brand price. Nikon is sporting technology that delivers performance far above expectations; the Nikon PROSTAFF 5 is packing enough power and technology for even the most demanding of experienced hunters. When considering this latest edition to the Nikon family, it becomes painfully obvious that Nikon has paid lots of attention to its consumer’s needs, and has dedicated an incredible effort to creating hybrid engineering perfection with this technologically advanced riflescope. Weighing in at a mere 19.9 ounces, the Nikon PROSTAFF 5 Riflescope is easily controlled by smooth, precision finger touch. The superior mechanical functioning of the integrated spring-loaded instant zero-reset turrets, make field adjustments as simple as dialing in your range. The Nikon PROSTAFF 5 is fully optimized for perfect Spot On Ballistic Match Technology performance. Although the Spot On Tech, which allows you the ability to find all of your exact points of a target for various range and ammunition needs, is a fantastic industry standard for all Nikon riflescopes, it is truly an even better experience with the Nikon PROSTAFF 5. Even during repeated, heavy recoil, your settings will remain locked in place, so when you use this scope, you say a definite goodbye to guesswork, and a big hello to improved performance with every shot. 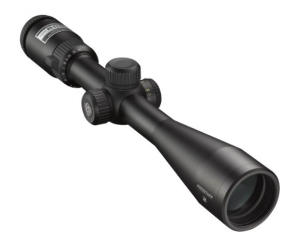 This is the best product choice when you’re looking for high a quality scope, and hunters can count on the fact that Nikon PROSTAFF 5 has successfully raised the bar on dependability, as well as durability in the market of excellent riflescopes. No need to worry about comfort or a bad brow fit. Nothing was overlooked with the NIKON PROSTAFF 5, as it continues to set itself apart by providing a splendid fit (even with safety glasses), you get a vivid, 7.2 – 28.6 feet at 100 yards field of view that is seen through a high eye-point design that will not disappoint…regardless of recoil. The Nikon PROSTAFF 5 also utilizes a fantastic red or green illuminated Nikoplex reticle which features a rheostat dimmer with a convenient side focus knob. The patented Nikoplex optics are incredibly efficient for filtering the best light transmission, even in low-level lighting situations – whether it is dusk, dawn, or anytime in between, this is the only scope you will need to guarantee a clear, precise, and comfortable shot, every time. The Nikon PROSTAFF 5 riflescope has quietly, and consistently, been finding its way up the lists of the markets top scopes for 2014 across the Internets top consumer websites. Bravo Nikon, you have successfully designed an “easy button” for accuracy. Let’s not forget to highlight some of the featured goodies that get overlooked, like, the Nikon Prostaff 5 is waterproof, and fog proof, it has a beautiful matte finish, and a precision 1/4 inch parallax adjustable setting. Perfect for use for Centerfire Short, Mid Range, and Centerfire Long Range, there is no doubt that you will shoot with more confidence on every pull.